The pictures are reminiscent of a war zone: hundreds of people run through the streets, shooting, launching tear gas, throwing stones and firing rockets. In the background, cars burn and the wounded await medical attention. Nine have died since a violent clash erupted just over a week ago in Oaxaca, Mexico between police and protesters. Most of the protestors are teachers from Section 22 of Coordinadora Nacional de Trabajadores de la Educación (CNTE), a teachers' union that opposes education reforms put in place by President Enrique Peña Nieto. The country's public education system is in a dire state, and the reforms have been supported in other parts of the country. Here, the clashes erupted after a police operation attempted to clear a roadblock set up by teachers on the federal highway between Oaxaca and Puebla, in Asunción Nochixtlán, in southwestern Mexico. The situation quickly turned violent. Some say the police were armed and ready to shoot from the beginning, while government officials insist police were simply reacting to violent thugs who infiltrated the demonstration. The most well-known example is Ayotzinapa, where 43 students from the Rural Teachers' College were kidnapped in 2014, after clashing with local police on the way to a mass protest. Some think that violence related to that case is somehow linked to what is happening now in Oaxaca. "Of course they are related," says Omar García, a survivor of the attack against the Ayotzinapa students. 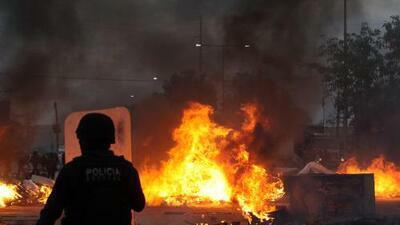 “The Mexican police in any state are a means to control social movements and break up protests. We haven’t only seen it in Oaxaca. … There have been many attacks against demonstrators." It’s a sentiment shared by people who aren’t involved in current protests. "I don't think there is a direct link [between Ayotzinapa and Oaxaca], but obviously the connection is the lack of respect for human rights in Mexico,” says Rodrigo Pacheco Peral, a political analyst in Oaxaca. Beyond Ayotzinapa, Pacheco and Garcia associate the current situation in Oaxaca with other protests staged in recent years, which have resulted in police violence. In 2014, the federal police were accused of killing 16 unarmed people in Apatzingán, Michoacán, who were protesting low wages. Acording to witnesses, police killed people who were kneeling with their hands up, unarmed. In 2015, the federal police violently suppressed a group of protesting teachers in Acapulco, who claimed justice for the 43 missing Ayotzinapa students. A 65-year-old man died of a head injury. "We have also seen very violent situations in Michoacán and Oaxaca in recent years in the wake of protests against education reform," adds Pacheco. "Nobody has died, but they have been badly beaten up." He points to an infamous case in San Salvador Atenco, a rural town in the state of Mexico where a violent police operation against a mass protest caused two deaths on Peña Nieto’s watch. Dozens of women were arrested and sexually assaulted by police on their way to jail. Amnesty International reported that doctors who attended to them did not record physical harm. Though it’s rarely discussed publicly, some people from the state of Oaxaca support the use of police force to control protesters. Entrepreneurs and business owners in the area have suffered from roadblocks set up by teachers for almost 30 years. "We need to work in peace," says Fabiola Calvo, president of the Consejo del Centro Histórico para Comerciantes, an organization of service providers in Oaxaca. "We are in a very critical situation. We have small businesses. We are in a very deep economic crisis. Businesses are closing, people can no longer pay salaries. It is very important to urge the three branches of government to restore the rule of law." But Calvo makes clear that this does not mean she favors violence. "All we want is to make clear that our small businesses are broken, and we need order," she says. Pacheco believes authorities are the only ones who have the power to restore order. "Before the police [react], everyone must engage in dialogue,” he says. “We need institutions that encourage dialogue. We must take this as an opportunity to change how we interact with each other. And the federal government must understand they have the responsibility to do this, because they are the ones in charge."